It’s been 15 years since a degenerative eye disease forced Erich Manser to stop driving. Today, he commutes to his job as an accessibility consultant via commuter trains and city buses, but he has trouble locating empty seats sometimes and must ask strangers for guidance. A step toward solving this predicament could arrive as soon as next year. IBM and an independent carmaker called Local Motors are developing a self-driving, electric shuttle bus that combines artificial intelligence, augmented reality, and smartphone apps to serve people with vision, hearing, physical, and cognitive disabilities. 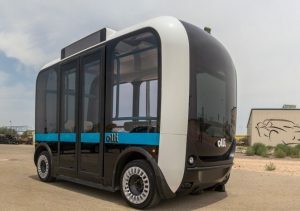 The buses, dubbed “Olli,” are designed to transport people around neighborhoods at speeds below 35 miles per hour and will be sold to cities, counties, airports, companies, and universities. These buses could be among the earliest self-driving vehicles on U.S. roads. Olli is fully autonomous without a human driver. Olli navigates using radar, lidar, and optical cameras. Before deploying in a neighborhood, it constructs 3-D maps of the area that are accurate to the half-inch. A human fleet manager then determines the bus route. When Olli detects an emergency via its various sensors, it will stop, notify a (human) remote supervisor, and independently run through a checklist of possible problems. “If a passenger has a medical problem or [there’s a safety issue], Olli will call the authorities or drive itself to a hospital or police station,” says Gina O’Connell, a Local Motors general manager who is leading the project. Local Motors and IBM started working together in 2016. The second version “Accessible Olli” will be manufactured in 2018 and will include assistive technologies. They have already identified some capabilities they are likely to add. For example, it can direct visually impaired passengers to empty seats, a vibration on their hand or arm will alert them to an empty seat. The buses could employ vision and augmented reality to read and speak sign language via onboard screens. The bus could recognize passengers waiting at bus stops who have walkers and wheelchairs and automatically deploy ramps and lock wheelchairs in place. It could even detect when passengers leave items under their seats for those with age related dementia and other cognitive disabilities. Olli will be a big improvement over current options. It is much more reliable to be able to get on and off a bus at the same place with a predictable schedule, especially if the bus has this type of assistive technology. Olli offers a way to address important limitations of public bus and train systems, offering more stops for people who use wheelchairs and walkers or scooters.